Identification: Upperside checkered with dark brown and orange-brown; forewing with white spot near tip. Forewing below is orange with black spots. Hindwing below is gray with scattered black spots; orange spots near margin and center of wing. Life history: Males perch and patrol near the host plant for females. Eggs are laid singly on leaves or flowers. Caterpillars rest in shelters of leaves tied together with silk and emerge to feed on leaves and fruits. Mature caterpillars hibernate in leaf litter. Caterpillar hosts: Fendler's snowbrush (Ceanothus fendleri). 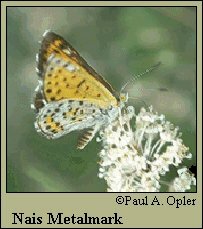 Habitat: Open woodland, chaparral, streamsides. Range: Rocky Mountains from central Colorado south to New Mexico, Arizona and northern Sierra Madre Occidentale of Mexico.